My first experience growing food was a community garden at Oberlin College. A couple of friends and I came up with the idea of a garden that college students and townspeople could work collaboratively on. There was very little experience among the four of us who came up with the idea - but so much enthusiasm. We had a great turnout when it came time to turn ground and plant the garden; then we left for the summer. Our sole caretaker was our one dedicated community member and a student who was living in town for the summer. We came back in September to a jungle of weeds. The sight didn't dampen our spirits. though. We waded through the weeds and found onions, tomatoes, and basil to harvest; we were ecstatic. With our bounty, we created a meal. I remember thinking to myself as we ate, "This is what food is supposed to taste like!" I was hooked, but knew I had a lot to learn in terms of field management. I was finishing an undergraduate degree (in my 30s!) at UVM (I never finished my degree at Oberlin) in the fall of 2011. This was the year that UVM's Farmer Training Program was getting off the ground. After obtaining my degree at UVM, I returned to work with a former employer in Agriculture education for the 2012 growing season (I was the Garden Manager at Farm & Wilderness in Plymouth, Vermont). I was admiring the Farmer Training Program from a distance, though - I sleuthed and followed its development through the early years of the program. I kept tabs on the program as positions opened up. When the Farm Manager position was advertised, I jumped on it. I'm an Oberlin drop-out (there are many of us), but I was turned onto the idea of farming while I was a student at Oberlin. My experience in their Food Co-operatives combined with my pursuit of an Environmental Studies major (because of their professor David Orr) inspired me to think about the food that I was eating. It wasn't the first time that I became aware of the politics of eating, but my time at Oberlin was transformative in that I began thinking more deeply about food politics and land management. I left college for a year because I wanted hands-on experience. I never returned to Oberlin because I was learning too much outside the classroom. 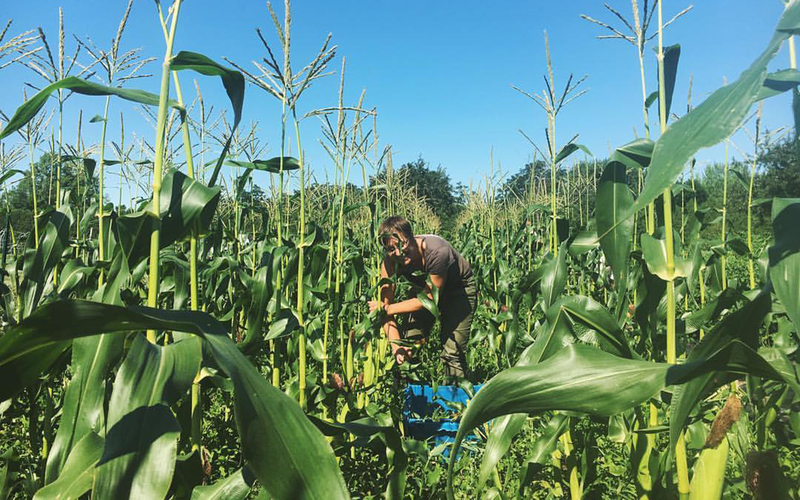 Since my early 20's I have farmed on an intentional community in Oregon, on a family farm in Maine, on a biodynamic farm in eastern New York, and on an educational farm in the Green Mountains of Vermont. As I said above, I went back for my undergraduate degree in my 30's. I understand the value of a practical education as well as the value of an unconventional educational program. UVM's Farmer Training Program is both of these: practical and unconventional. Our program is hands-on with a classroom component; it's educational and also productive - we want the work to be meaningful for our students. We attract a wide range in demographics; we have had students as young as 19 and as old as 59. It is part of what makes the program as rich as it is. This is not a statement of epiphany: farming is hard. If you come from money or from a family with access to farmland it might be a little easier, but it's still hard. It is also tremendously rewarding. I have questioned my path at many points, especially during moments of transition. I have asked myself on more than one occasion, "Am I crazy for wanting to pursue this line of work?" and, "Why do I always seem to do things the hard way?" I keep going because the rewards outshine the challenges. I love working outside; I love work that involves my hands; I like the significance of being dirty at the end of the day; I appreciate tangible accomplishments; I appreciate work that is value-driven; I appreciate my "office-window" being one of looking up and acknowledging the beauty of my surroundings; and I love working with students who are inspired by all of these aspects of farming as well. One of my mentors is Jill Agnew. She owns and operates Willow Pond Farm in Sabattus, Maine with her husband, Charlie. I worked for her for two years. My strongest memory of working with her was her ability to keep her cool and proceed with confidence, even when she had good reason to lose her temper and become discouraged. Whether it was deer in her corn patch, expensive electric fencing tangled up in her rototiller due to inexperienced operator error, incessant rain and flooded fields, renegade sheep, unbelievably long days (especially when the growing season overlapped with peak apple season), she remained calm, kind, and patient. I am forever trying to emulate her abilities as a farmer and educator. I believe that locally produced food and knowing your farmer is beginning to expand beyond trendy. I recognize that Vermont is a "national model in alternative food-systems development" (yes, direct quote from FTP's website). So, Vermonters can be spoiled and forget that we live in a bubble in terms of how many people in the state value our agricultural history and appreciate knowing the name of the farmer (and can probably picture the face of the farmer) who raised the food that is about to be incorporated into a meal. That being said, I interact with students each season who hail from all over the country. Some stay in Vermont, but many return to their home states after graduating from the program. I feel confident that smaller, diversified farms have a place in our food system and that communities around the country are embracing this. Whether a person decides to farm on a production-scale or within an educational environment, or whether they advocate for small farmers and healthy land management through a non-profit or other business, or whether they are a conscientious consumer for a business or for their own home, there are many ways and scales for an individual to become involved in our food system landscape. I have my eye on one of Zyl Vardos' tiny houses. He's a builder and an artist in Olympia, Washington. I am floored by his creations. If I could park one of those at the farm, my commute would be a little easier.